I participated in a campaign on behalf of Mom Central Consulting for Zarbee’s Naturals. I received a promotional item as a thank you for participating. All opinions are 100% my own and may differ from yours. I will only endorse companies, products and services that I believe, based on my own experiences, are worthy of endorsement. Spring is finally here… even if we had snow one day. The temperatures have finally started warming up, even feeling like summer a few days recently. I love it. However, I do not love the seasonal congestion I’m experiencing. It’s infuriating, in fact. I want to be outside enjoying the beautiful weather, but the congestion is driving me crazy. The congestion makes it unpleasant for me to do the things outdoors I really enjoy. Thank goodness for Zarbee’s Naturals. 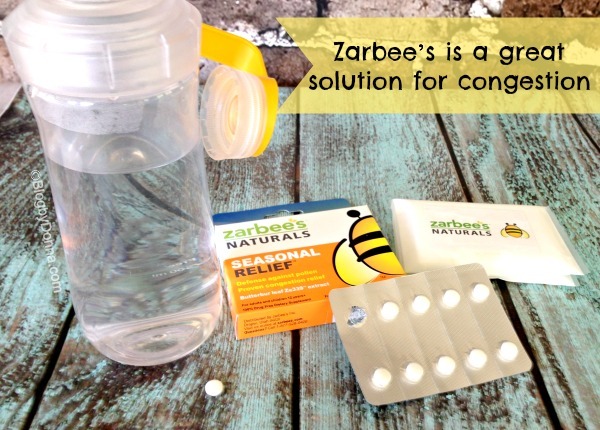 Zarbee’s is the perfect solution for seasonal congestion. Like the Saturday before Easter we went to my in-laws for a cookout and let my son and his cousins hunt Easter eggs… if I had not taken a Zarbee’s Natural I would have been miserable hanging outside all day. Zarbee’s Seasonal Relief will help me maintain the active lifestyle I enjoy. I sure don’t want this congestion to keep me from my weekend hikes in the Great Smoky Mountains. I especially love that Zarbee’s Naturals is made with natural Butterbur to help combat congestion. I try to take things that are all-natural whenever I can. Americans seeking a natural solution to congestion could benefit from natural Butterbur, an extract benefitting Europeans for centuries, being reintroduced by Zarbee’s Naturals in its purest form as Seasonal Relief with Ze339. Although Butterbur has been available in the U.S. for decades in various forms, Butterbur Ze339 in Zarbee’s Seasonal Relief is the purest form of the plant extract, derived exclusively from the potent leaves of organically grown butterbur. Both a humble weed and a powerful plant, Butterbur got its name because farmers once preserved butter by wrapping it in the herb’s huge, heart-shaped leaves. The plant grows wild along rivers, ditches and marshes worldwide, though the Zarbee’s extract is farmed organically in Germany. I found some great tips on the Seasonal Relief Project website, and I also scored a free product sample. One thing I do to help relieve congestion is apply hot or cold packs around my sinuses. Please visit the Seasonal Relief Project website to learn more about the project, receive tips to help with seasonal congestion and sign up for a free product sample for yourself. Every time someone visits the Seasonal Relief Project website to share how Zarbee’s Naturals’ Seasonal Relief with Butterbur worked for them, the brand is donating to four causes that support exposure to and the protection of fresh air, including Fresh Air Fund, Children & Nature Network, and Moms Clean Air Force, and Healthy Child Healthy World. All the more reason to try Zarbee’s Naturals’ Seasonal Relief! So be sure and receive YOUR own customized seasonal congestion tips as well as sign up for a product sample. You can find Zarbee’s Naturals’ Seasonal Relief over-the-counter at CVS and Target. Zarbee’s is intended for children 12 years of age and over. Definitely something I have to take a look at. This is the first spring we’re here in Texas and I’m pretty certain that there is a whole host of pollen here that our noses and eyes have never encountered as my poor husband is congested and sneezing all the time the past few weeks! That kind of congestion can make you crazy! I’m glad this is helping! I want to say that I have tried this brand before, but I’m not totally for sure. Either way, I definitely need something like this! I have been experiencing nasal congestion off and on for the past month or so. I love that there is natural relief available for seasonal issues! With all the wind we experience, our allergies are going bananas lately. I wonder if this would help my daughter and my husband. The regular decongestants give my husband nose bleeds. I might have to try this. My allergies are killing me this year and I have tried almost everything else. I tried this recently myself and it really worked well for me! I need to check this out. My 6 year old has allergies. Allergies are so not fun, but I hate taking a lot of medications. I love that this is made from more natural ingredients. I’m having the worst allergies right now. I’ll have to try this! Congestion is the worst! With all the pollen in Georgia, anything that helps is a winner in my book. I really think this is going to come in handy for my husband. My daughter would benefit as well but she isn’t old enough yet. My boys aren’t old enough to take that but I may need to look into it for myself. My allergies have been SO bad this year! I hadn’t heard of Zarbee’s Naturals before. I’ll have to try their products. I use their cough medicine for my son. I’ll have to look into this for seasonal allergies. My sister has a ton of issues with allergies, but likes all natural products only. This would be a great solution for her. I definitely need to look into this. My little guy is suffering from some congestion right now.